Judi Best, Executive Director of the Wetaskiwin Chamber of Commerce and point person for planning of Summer Showcase 2014, worked with her Board, volunteers and staff during the past year to ensure everything was staged to make the weekend a success. It was not only a success; it was a resounding success. Thousands of people converged on the City to partake in the sights and delights. Without a doubt, the weekend offered something for everyone. The hub of the weekend was the newly created ‘Main Street Promenade’. The Main Street in Wetaskiwin was closed off for the weekend and became a flurry of activity including the location for the midway, food vendors, ice cream stands, street performers, the Community Music Stage and much more. A sunny Saturday morning provided the lighting for a stellar performance as the streets became packed with spectators waiting to witness an awesome parade. They were not disappointed. Later in the day, a sold out crowd was treated to a fantastic concert by Canadian rock band, ‘Trooper’. There was the Heritage Museum celebrating Civic Pride, the Rawhide Rodeo, Slicks Show ‘n Shine and the Reynolds-Alberta Museum hosting thousands of guests. And the list goes on. At 11:00 am on Saturday, spectators lined the streets and were entertained for more than an hour by a variety of exhibits making up the first class parade. 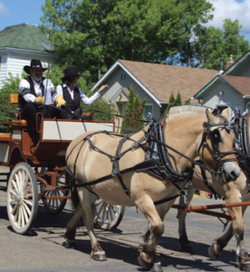 Numerous floats, bands, horses, antique cars, dancers, trucks and tractors wound their way through the downtown area showcasing organizations, businesses and families. The Community Music Stage located at the Wetaskiwin Credit Union featured live musical performances beginning at noon and finishing at 6:00 pm on Saturday. Crowds gathered to listen to five local groups performing all styles of music ranging from blues, to old time rock and roll, to country. There were food kiosks throughout the Main Street Promenade and surrounding streets. Hotdogs, hamburgers, pulled pork and spring rolls were appreciated by the crowd while helping raise funds in support of local community organizations. Horizons Centre Family Fun Kids Event was held on Saturday, noon to 5:00 pm and Sunday 11:00 – 5:00 pm next to Tracy`s Bridal. The Wetaskiwin Arts & Craft Centre and Wetaskiwin Arts Club held a Craft and Art Show along with a Kids Craft Carnival on Saturday, June 14 from noon to 5:00 pm in the former Jonathans Men`s Wear on Main Street. Reynolds Alberta Museum drove into the action by hosting the Ultimate Car Show on June 14 & 15 from 10:00 am – 5:00 pm followed by the annual History Road Cruise through Wetaskiwin, beginning at 4:30 PM from the Reynolds Alberta Museum and rolling into town along Highway 13 and down 47 Avenue. The Heritage Museum on Main presented the “Pioneer of the Year” Award to Mervyn and Lorraine Arnold. The evening also included a presentation on “Main Street, Old & New” that included photos from the Museum and the City archives. In keeping with their theme of Civic Pride, the Museum hosted a further Pioneer Day ceremony on Saturday that honoured additional volunteers who have made contributions to the advancement and beautification of the City and County. They also hosted a children’s artwork contest featuring artists’ favourite aspect of the new Main Street. If one had to pick a highlight of the weekend activities, the Canadian rock band ‘TROOPER’ concert in the Drill Hall on Saturday night was right up there. The sold out crowd was treated to the opening act performed by the local band ‘Blunt Force’. Edmonton International Raceway opened their season at their track northwest of Wetaskiwin on June 14, with the Roy Ross Memorial IMCA Special. East of Wetaskiwin, the Wetaskiwin Ag Society hosted the Raw Hide Rodeo with performances on Friday at 6:30 pm and Saturday and Sunday at 2:00 pm. The Chamber brought in the Street Performances to entertain people along the “Main Street Promenade” on Sunday, June 15. These are the same performers who participate in the Edmonton International Street Performers Festival. On June 14th, the Fire Department hosted a “Dunk Tank” with proceeds going to the “Mending Mikayla” fund. Dunking a firefighter cost $5, a friend $10, a City Councillor $10 or the Mayor for $15. Congratulations to the Wetaskiwin and District Chamber of Commerce for providing an action-packed weekend of fun, laughter and enjoyment of the entire community and region. And don’t forget the importance of all the out-of-town guests who visited Wetaskiwin for the event, saw what Wetaskiwin has to offer and spent the weekend feeding the local economy. See many more festival photos in this week’s paper.